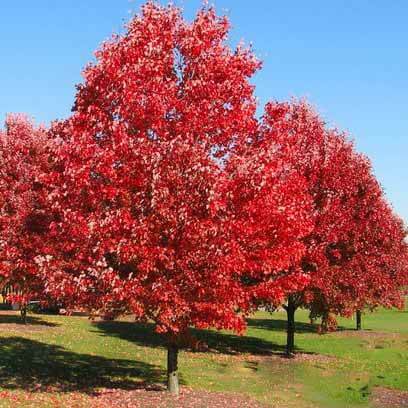 Red Oak Tree For Sale - Low Prices Online & Fast Ship! The Red Oak Tree grows faster than most oak trees. It can grow up to 80 feet tall at maturity. The tree that grows throughout Midwest has a large trunk and spreading branches with glossy green leaves in the summer, followed by brilliant red foliage. It is a hardy tree that grows in zones 3 to 7. The red oak is a long-lived tree that proliferates on fertile and well-drained soils. The tree provides one of the most abundant shades making it suitable for landscaping purposes, and its wood is excellent for fencing. In the late summer, its acorns give food to squirrels and birds. 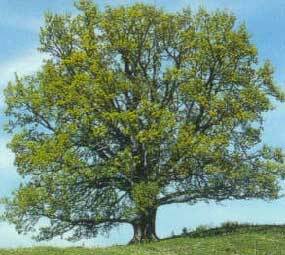 Red Oak Tree is a medium sized tree. This is a tree that grows at a moderate-to-fast rate and can grow up to 2ft every year. Red oaks typically bloom in April - May. They are a low maintenance tree that prefers fertile, sandy, finely-textured soils with good drainage. The bark is dark gray or black with broad, thin, scaly rounded ridges. Red oaks appear to have shiny stripes down the center of them all the way down the trunk. This makes red trees easy to recognize. It grows dark, lustrous green leaves with a grayish-white bottom. The leaves have a growth rate of 10 inches wide and 7 inches wide. Its leaves are tooth lobed and sharply pointed at the tips and displays bristle tips. They have growths on the tips of them that resemble stiff hairs. 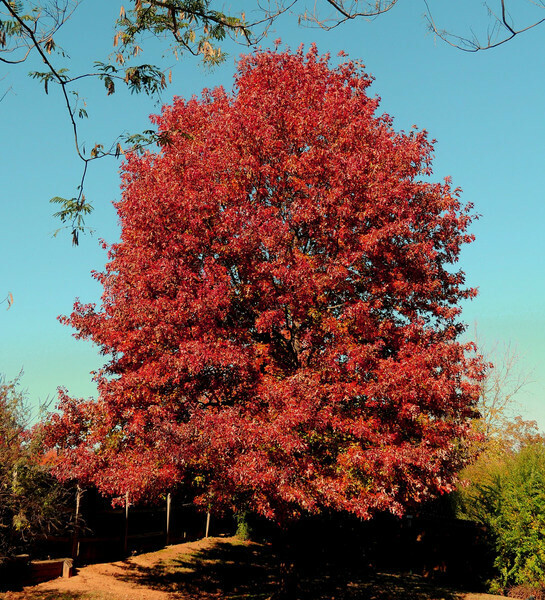 The red oak has brilliant fall foliage as the leaves turn bright brick red and tend to hold their color much longer than any other deciduous tree. The trees grow acorns that are flat, saucer-shaped cups and are about 15-30 cm long and do not mature until the second year. They are borne singly or in clusters of 2-5. The red oak first bears fruit at about 20-25 years old but may not produce an abundance of acorns before the tree reaches 40-50 years old. Most parks and campuses use them for shade as well as private lawns where space is sufficient. A wide variety of birds and mammals also use them for coverage and great nesting sites. It will grow best in soils that are well drained in their compositions and will appreciate a full sunlight environment. It will be beautiful for most of the year. With bright green foliage during the summer, the leaves will transform into reds and oranges with the arrival of fall. It becomes a favorite with homeowners quickly. Native to the Eastern United States and Canada, Red Oaks can grow to be over 500 years old. Favorite among landscapers, the Red Oak makes for an attractive focal point in any yard all four seasons of the year. However, these trees burst with crimson hues in the spring and autumn. In the spring, blossoms emerge a vibrant pink or sometimes maroon tone before the leaves take on a mature, dark green or green-yellow hue for the summer. True to its name, the Red Oak puts on another crimson display in the autumn before the leaves turn a neutral, brown hue in the winter. Northern Red Oaks often hold onto their leaves into the winter months for protection from disease. Even when the tree's leaves fall, the Northern Red Oak can still display its attractive bark with its distinctive glossy lines in between the furrows.